A new paper in the journal Science by Raquel Garcia and coauthors provides one of the first comprehensive reviews of how different aspects of climate change are projected to differentially affect the regions of the earth, and what those contrasts imply for biodiversity. Their findings suggest that while polar climates are projected to warm and shrink in area, the tropics will see the emergence of novel climatic conditions and undergo local changes in average climates beyond past variability. 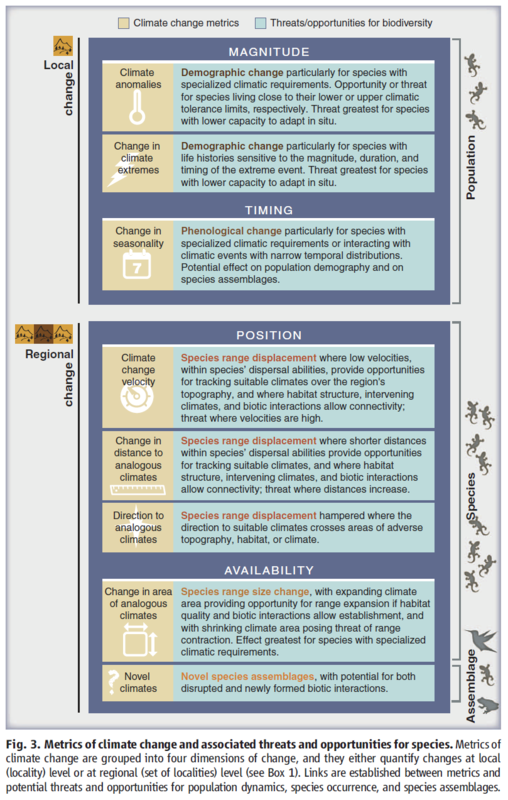 The review outlines a conceptual framework for classification of climate change metrics according to the types of threat and opportunity they are likely to impose on biodiversity, which can assist in planning to enhance climate resilience and adaptation potential. Figure 3 from Garcia et al. 2014.
rights and values of nature.